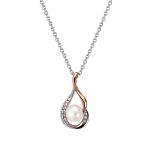 Jersey Pearl have been passionate about pearls since 1985. The true pearl specialists, hosting the most beautiful pearl jewellery. From the exotic, iridescent colours of the Tahitian pearls and the golden hues of the South Seas, to the classic allure of the Akoya and Freshwater pearls, our collections present stunning variety. From the beautiful bridal range to the designer collections, the range has something to suit all. A selection from the Jersey Pearl range is available in our Online Shop with a further selection in our stores in Crewe and Newcastle. If you cant see the specific Jersey Pearl piece please contact us and we will be happy to find it for you.